Shares of Ballard Power Systems (NASDAQ:BLDP) fell more than 20% in 2018. But the fuel cell stock has been electric so far this year, rising nearly 30%. Ballard pleased its shareholders early in 2019 with news that the company's partnership with Weichai Power is progressing as expected, renewing hope for the company's future. A publicly traded company for more than 20 years, Ballard has made great strides in proving the value of its fuel cell solutions; however, like its peers, it has failed to achieve profitability. Still, management believes the future is bright for the fuel cell industry. Following the release of the company's fourth-quarter earnings, Randy MacEwen, Ballard's president and CEO, stated, "There is mounting evidence that the shift to zero-emission transportation is accelerating and that fuel cell electric vehicles, or FCEVs, will play an integral role," adding that last year the company "made significant progress as we continued to position Ballard to be a key player in this market disruption." With this in mind, let's take a look at three charts that provide greater insight into the company. While Ballard did an impressive job growing its top line from 2015 through 2017, the company's annual revenue has waned over the past two years. Most recently, in 2018, the company's ebbing year-over-year sales were due to a decrease in fuel cell shipments to China. Data source: Ballard annual reports. Chart by author. Although the company remains optimistic about its prospects in China, the lagging sales are noteworthy since skepticism about the company's success in the country surfaced last year in a report from Spruce Capital. While Ballard has had difficulty growing revenue over the years, some publicly traded fuel cell companies have fared notably better. For example, Plug Power (NASDAQ:PLUG) has reported rising annual sales: $83 million in 2016, $100 million in 2017, and $175 million 2018. Expecting continued growth, management forecast full-year 2019 revenue of $235 million to $245 million. Check out the latest earnings call transcript for Ballard Power Systems. Over the past few years, Ballard's top-line growth has been less than electric; however, investors may have taken some solace from the company's ability to consistently generate a gross profit. The company certainly deserves credit for the feat considering the challenges fuel cell companies have faced in trying to keep costs under control. Plug Power, for example, has generated a gross profit in only two of the past 10 years, according to Morningstar. But Ballard's ability to keep costs in check doesn't translate much further down the income statement, where the ink remains tinted red. The company, like Plug Power and Bloom Energy (NYSE:BE), has failed to generate a net profit. 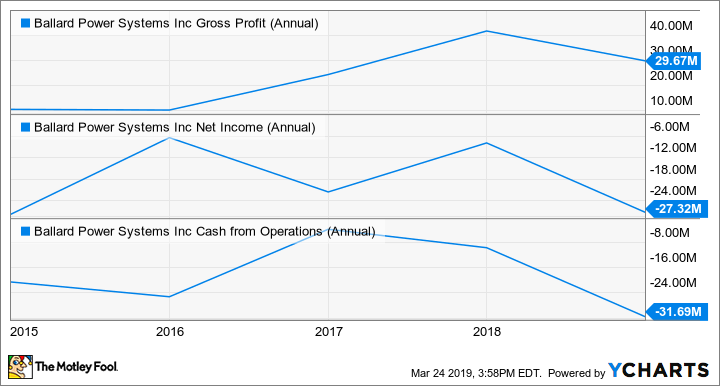 Due to creative accounting, it's not unheard of for a company to report net earnings and, simultaneously, report positive cash flow -- or vice versa. In Ballard's case, though, this doesn't apply. The company has consistently failed -- like its peers -- to generate operational cash flow. For longtime shareholders, the dilution may be undesirable, but, on the bright side, the company hasn't had to jeopardize its financial standing. In fact, Ballard ended 2018 with a net cash position of more than $192 million. Other fuel cell companies don't sport a balance sheet as unburdened as Ballard's. Bloom Energy and Plug Power, for example, ended 2018 with net debt positions of $491 million and $24.9 million, respectively. After only a superficial look, one could point to Ballard's waning annual sales and conclude that the company is in a precarious situation. 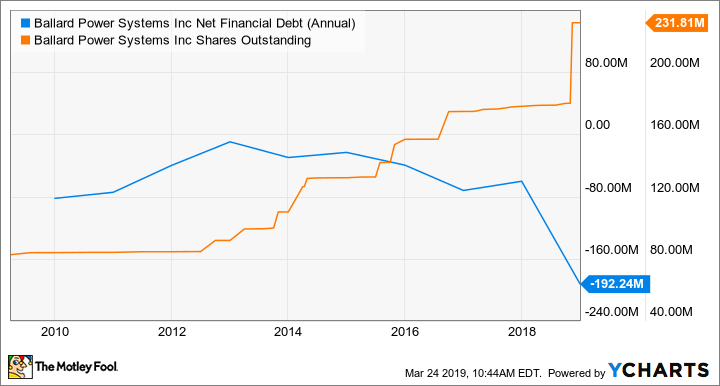 Dig deeper, however, and one finds that the company has been able to distinguish itself from its peers by consistently generating a gross profit and surviving without the weight of a burdensome balance sheet. Based on a recent press release related to Q4 earnings, it's highly unlikely investors will find the company reporting a profit in the next year or two. Management, nonetheless, maintains an optimistic long-term outlook predicated on the company's dealings in Asia, Europe, and the U.S. -- an outlook MacEwen neatly summed up: "[W]e anticipate significant growth in China, Europe and California, setting the stage for attractive return on investment for Ballard and our shareholders."